Christmas is just around the corner and for the past couple of weeks I've been publishing my annual gift guides, they're a great way to get a little bit of inspiration before the big day. I've already published my gift guide for men, one for us ladies, one for the kids and today brings me to my final one for the year, aimed at the little ones in our lives. 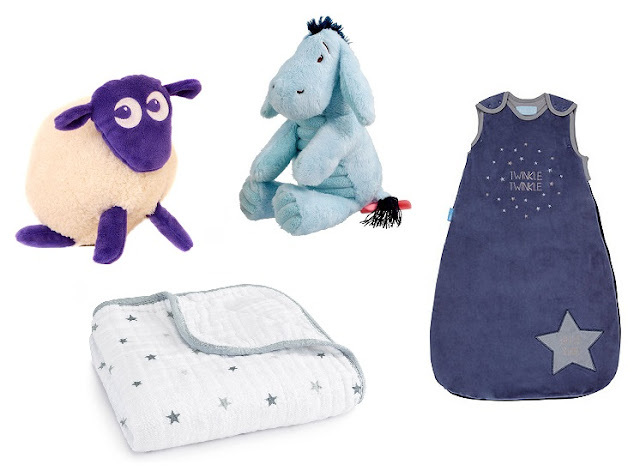 Having a baby myself I've included a lot of items that I'd personally love to receive for Ava, especially the essentials which are listed towards the top of the guide. I hope my suggestions give you a couple of gift inspiration and ideas for Christmas and beyond. Ewan the Dream Sheep plays soothing sounds on a low and slow base frequency and emits a calming pink glow, designed to help babies drift off to sleep. There's three white noise sound options, the vacuum cleaner, rain falling and womb sounds and gentle harp music, all of which play for 20 minutes giving your baby plenty of time to doze off to sleep gently. Ewan is number one on my list for a reason, here are so many parents which swear by this little fluffy sheep, myself included. Both Noah and Ava have one each, Noah has the purple original Ewan and Ava has the new grey version. The perfect gift for any new baby. Rainbow Designs have collaborated with The Walt Disney Company to launch a stunning new collection of infant soft toys. The new Hundred Acre Wood Signature Collection features one of the world’s most famous bears, Winnie the Pooh and some of his most lovable friends. We received Eeyore from the collection and I think he would make a lovely first teddy to a new baby on their very first Christmas. Grobag's are another of my baby essentials, I swear by them! When a friend is pregnant or when someone is thinking of buying a gift for a baby, a Grobag is always the first thing I recommend. In case you didn't know, a Grobag Baby Sleep Bag is a wearable blanket that will keep your baby at a comfortable temperature all night long. There are different togs for different temperatures and more details about togs and temperatures can be found on their website. Grobags are so much safer than using loose cot blankets as nothing can ride up on their face whilst they are sleeping, this of course is great for peace of mind. We are currently using the Twinkle Twinkle Grobag which is a 3.5 tog and comes in three different sizes, from 0-6 months through to 18-36 months. This is a great option for the winter months, especially if the bedroom your baby sleeps in a cool room, like Ava does. The dark blue velour material is absolutely heavenly and I kind of with they did them in adult sizes too! aden + anais are another of my all time favourite baby brands, they are famous for their multi functional muslin cloths but their classic dream blankets are amongst my favourite products that they produce. These blankets feature four layers of 100% cotton muslin for the softest, most plush baby blanket ever! It's uses go beyond keeping your baby warm but it also makes a comfortable surface to lay your little one on no matter where the day takes you, to the park, the beach or just playing around on the floor. They come in an array of different colours and patterns and they usually have matching muslin cloths and musy cloths too! When it comes to babies and Christmas you have to go all out with Christmas themed gifts and this festive bib is the perfect attire for when they are at the table, eating their Christmas dinner! Made from flexible and waterproof neoprene, with a soft pocket that folds out to catch any dropped food. This makes this bib perfect for baby led weaning because not only does it catch any dropped food but they can easily retrieve the food themselves and carry on eating. Ava will be wearing hers on Christmas day, that's for sure! Reusable nappies are a great gift idea for those environment conscious parents out there and Tots Bots are the best of the best, in my humble opinion! Their award winning Easyfit Star is the ultimate one piece reusable nappy for absorbency, fit & comfort, with an out of this world performance. Their super absorbent bamboo core is so soft and gentle next to babies bum. They has stay dry buffer zones to keep liquid locked into core, making sure baby is comfortable and dry. 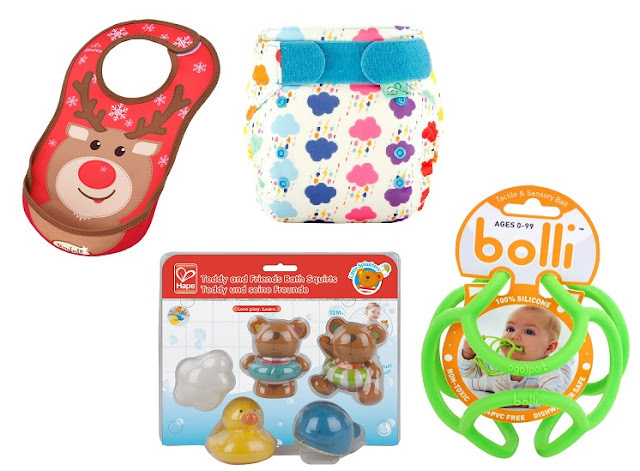 One size fits most, from birth through to potty training! Using cloth nappies can save parents hundreds of pounds and buying all the different prints and patterns can become quite addictive, don't say I didn't warn you! If bath time with your little ones is more hassle than enjoyment then look no further than Hape’s Little Splashes range. Sure to provide never ending entertainment and happiness in the tub, create a beautiful bond between parent and child, whilst learning valuable water skills, encouraging growth and development. For hours of fun in the tub enjoy this set of lovable characters. As they soak up your bubbles, just make sure they don’t get too greedy and drink up all your water! Suitable for 0 months +. Bolli is perfect for sensory development, shape exploration, fine motor skills, grasping and hand-eye coordination. It’s soft and pliable material can be squished, stretched and manipulated in so many different ways. I'ts great for stretching, twisting and grasping too. The open ball design makes it easy for babies to chew while teething and also makes it easy to grab a hold of. It's ideal for infants for for teething but it's also great for older kids for imaginative play or for when they are learning to catch. Get into the festive cheer with the Twirlywoos and their new book, Happy Christmas Twirlywoos! Knock! Knock! Knock! There’s somebody at the door! It’s a Christmas present! Join the Twirlywoos for lots of festive fun as they discover what’s inside their mystery gift!Packed with trademark Twirlywoos fun, this gorgeous shaped board book has a shiny foiled cover and is the perfect gift for every Twirlywoos fan. This Mini Club Christmas reindeer jumper is the perfect festive addition to any wardrobe. 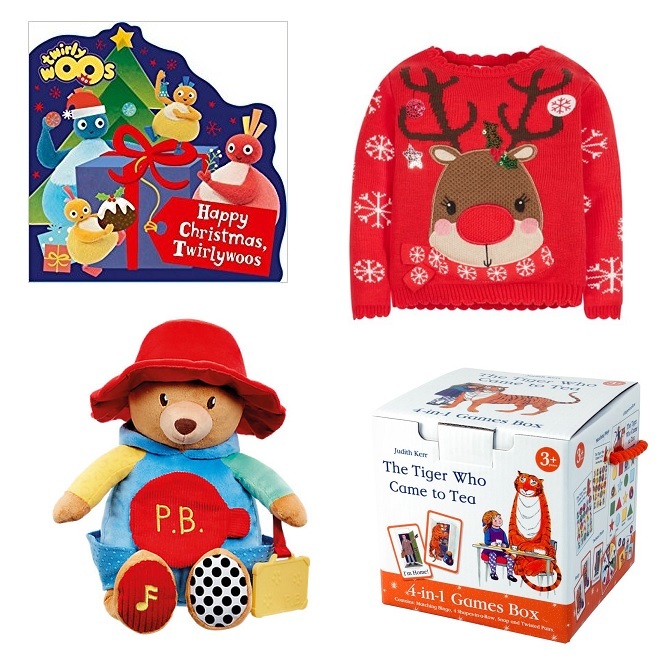 Featuring a bold red background, and reindeer character with sequin and glitter bauble decorations. Perfect for your little one's first Christmas or a great idea for a gift. I was recently sent two Christmas jumpers from the Mini Club range for the children to wear on Christmas day and they are beyond gorgeous and super thick and soft. This Paddington Bear Activity Toy stimulates baby’s senses and engages their imagination with a host of fun activities to explore in just one toy. Perfect for little Paddington fans, the super soft Activity Toy, embroidered in beautiful detail, plays a tune and features a baby safe peek-a-boo mirror and suitcaseshaped yellow teether. It has been designed specifically to encourage baby's early developmental skills and includes multiple textures and sounds. The Activity Toy come in a platform box and is suitable from birth. The 4-in-1 The Tiger Who Came to Tea Cube Game is a little box jam packed with four traditional fun games for preschoolers, a great gift if you want to buy them something they'll grow into as babies really don't need that much. Included in the set is, Matching Bingo, Snap, Twisted Pairs and Four Shapes in a Row. The Games Cube features beautiful artwork from Judith Kerr’s classic children’s story book. Measuring 135mm cubed the 4-in-1 Games Cube contains colourful and educational games that are just perfect for children. This beautiful knitted cardi coat is an essential for the colder months, a stunning piece which I think any parent would love to open up on Christmas day for their little one. It's made with the softest cotton for your little ones comfort and warmth, it's decorated with large gold buttons down the front and finished with a delicately embroidered heart charm. Available in three different colours, snowdrop white, ash grey and vintage rose. You can buy directly from the Angel's Face website. The In the Night Garden My Friend Upsy Daisy is the sweetest of toys. She comes complete with exciting accessories such as a soft comb, mirror and flowery bag to encourage imaginative play. Made in bright, eye-catching colours and with a soft, huggable body, My Friend Upsy Daisy is the must-have companion for all In the Night Garden fans. The Giggling Tiddlytubbies Soft Toys are super tiddly! Simply press their tummies to hear them giggle. They are made of softest material and look just like the adorable characters from your little one's TV show, this makes them perfect to snuggle up too. A great gift for any age, collect them all. 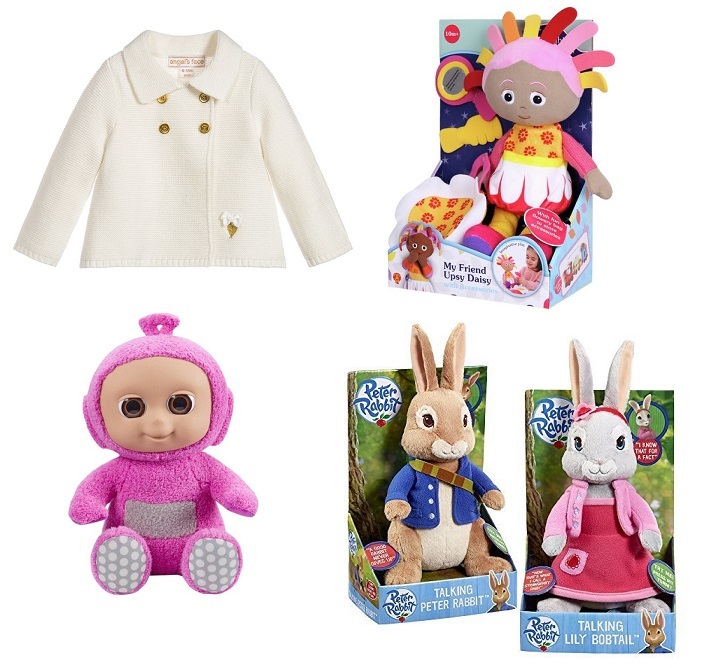 A fun-packed feature plush toy from the TV Peter Rabbit Toy Collection! Watch Talking and Hopping Lily Bobtail waggle her cute little ears and also hop up and down. The endearing 40cm character also says five different phrases including ‘Not bad for a rabbit’ and ‘You need a big hug’. The fun-loving Lily wears her characteristic pink dress and jacket and is suitable for children 10 months and over. If your little one prefers Peter Rabbit then you can also get a Talking and Hopping Peter Rabbit instead! As mentioned on my previous gift guides, there's a lot of variety in my gift guides this year, for all budgets. Make sure to keep a look out on the blog this week, as I'll be publishing further gift guides and keep an eye on my competition page as I'll be giving away quite a few items which I've included. - This post contains PR samples. some great ideas here. I had no idea what to buy my one year old nephew until now, so thank-you. I know a grown up who'd love that Eeeore!! Great ideas for gifts for little ones. Wishing you all a Merry Christmas.